Lately I've been meeting my sister in law to walk her dogs at Lillie Park. The beauty is, whether I walk Butch (left) or Brandy, I'm never on poo patrol! I ride my bike to the park and then take a longer ride after walking the dogs. I thought you might like to come along. Relax, you don't have to worry about mosquitoes or humidity, and I'm doing all the pedaling. I ride through Mary Beth Doyle Park on the way to meet my SIL. I talked about this retention basin last time, and you can see the water level has gone down. After leaving Lillie, I take the new bike path as far south as it goes. 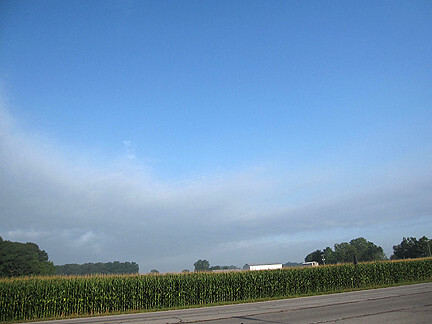 I'm heading out of town, so I see pastoral scenes like this with corn as far as... the next subdivision. Having an odometer is a mixed blessing. It's cool to know how far I've gone, how fast I'm going, and what time it is, but it also kind of pushes you to do more miles to round up (13.56 miles is for wusses! Gotta do at least 15). I often add miles on side streets, which is how I discovered Freedom Drive. It's a ridiculously short dead-end street off another mostly-forgotten dead-end street with light industrial buildings, many abandoned. 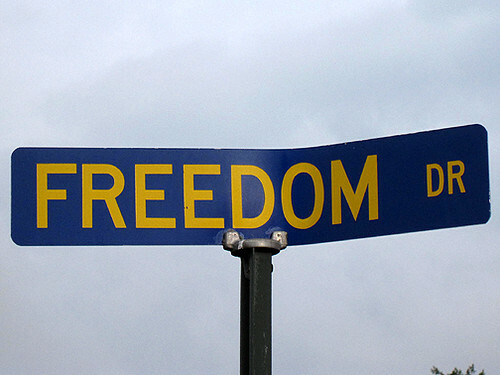 I guess it makes sense that freedom hides in a dilapidated place many of us never choose to go. And biking is freedom for me. One of the few ways an otherwise inelegant person can fly. Sometimes I also ride through subdivisions. Caution: I brake for free plants. 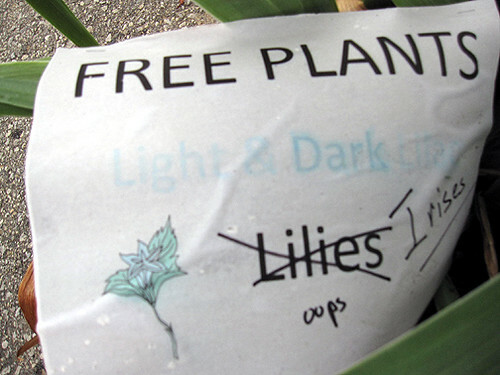 I didn't need any lilies, oops, irises, but I loved the sign. Heading west, I generally take this dirt road though it can be bumpy, which reverberates through your whole body in a disconcerting way. 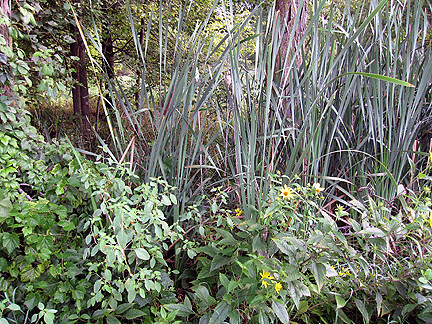 The tall plants on either side are invasive, non-native reed grasses, Phragmites australis. 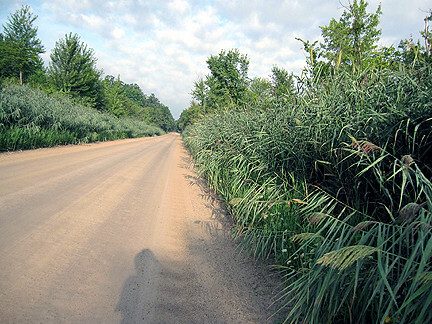 A horticulturist once described the ID process this way: "If you're in a wet area overgrown with a single kind of really tall grass, and you're not sure if it's Phragmites... It's Phragmites." 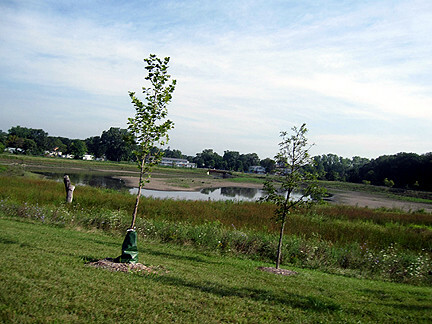 A boardwalk view of the marsh at Marsh View Meadows Park. 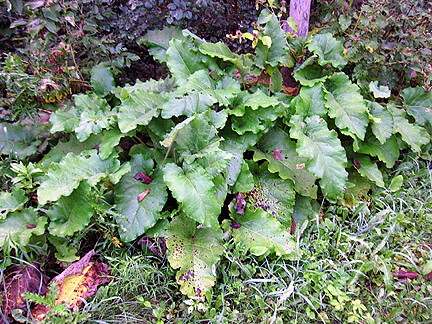 I always get excited when I see burdock because my first thought is always prairie dock! Burdock is a biennial thistle whose seed pods stick to your clothes. The mosquitoes were wicked in this spot. 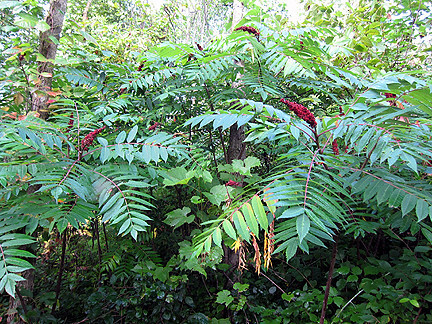 Ann Arborites know you can forget about the summer when the sumac is on fire. Just because they kept the silos, doesn't mean the farm's not gone. Not harmony. 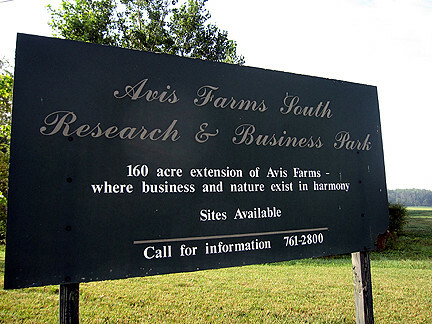 But, look, here's a working farm, just down the road from said bid'ness park. And here's the best location for listening to frogs in southern Ann Arbor, Morgan Woods Nature Area, northwest corner of Morgan and Stone School Roads. Can you see the jewelweed at the bottom left? I was hoping some of the alpacas would be out at the local alpaca farm, but they weren't. 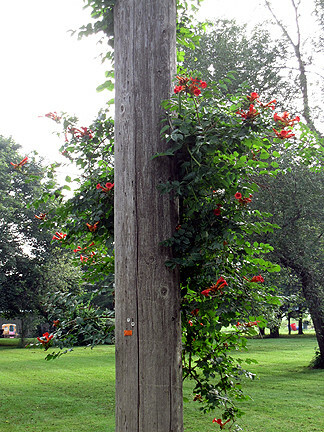 You'll have to make due with this trumpet vine. I know it's not the same, but it's what was there. Heading back into suburbia now. 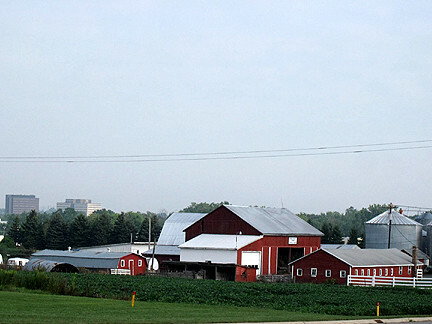 I love the contrast of this working farm and south Ann Arbor's two tall buildings to the west. 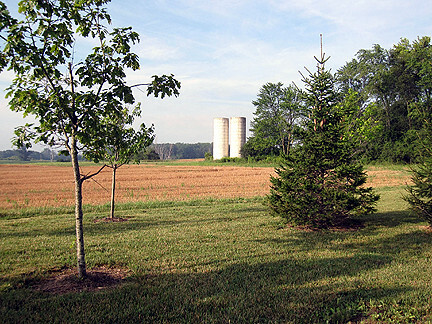 The same farm, looking south, contrasts with a small light industrial complex. 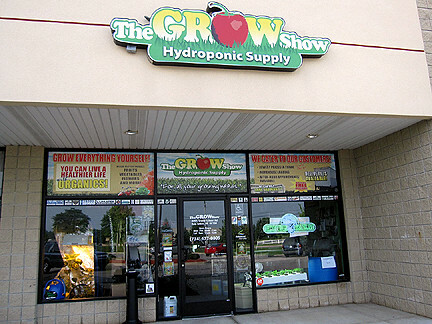 Directly across from the farm to the east is a strip mall, which includes my high-end soil supplier, the Grow Show. The two duuuudes who run it are awesome. The last time I passed that farm, they had an 1800s buggy (minus the horse) for sale. This tractor is way cooler. 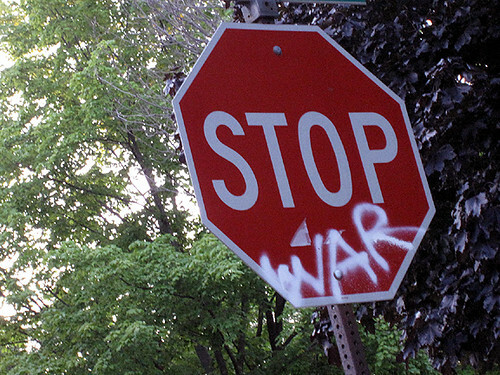 This sign is in a friend's neighborhood, not on my normal route, but it could just as easily be. It's so quintessentially Ann Arbor. OK, fess up. Did the title get you humming Nelly or John Mellencamp? I went both ways! I enjoyed your ride. It makes me want to get out and ride. It is too darned hot here though. It has been in the high 90's all week and will continue. UGH..
Wow! That is quite a ride! I would have stopped for free plants too! And I would have scooped it up! 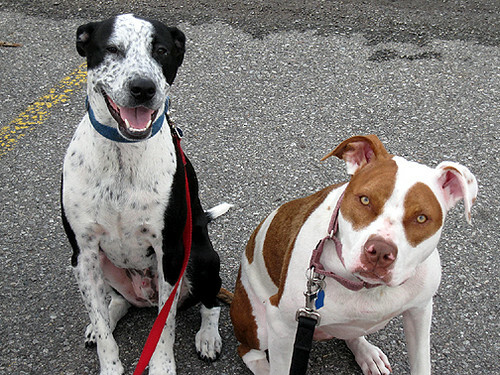 Cute dogs! What a nice break it was riding along with you - thanks! 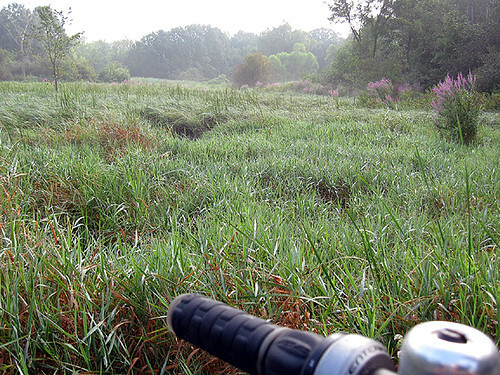 The title doesn't ring a bell for me either way, but I'd sure love to have countryside within biking distance. I'm in Toronto, in the middle of a big, hot, stinky city heatwave right now. Hi Monica, lovely dogs. I am a dog lover as you know. The area you live in is so varied and interesting. I love the wilder parts. I have a thing for little red tractors....and sheds....I am beginning to worry about me! Finally Monica, well done. I really admire you for going out there and riding so far. My jealousy indicator just hit 10. Great ride and lovely country. How wonderful to have actual farms so close to the city and to still have country roads that a bike can travel unmolested. Used to ride a lot, but the cars finally took back the roads and it got too dangerous for bikes. What a shame. Sorry you didn't need the lilies - oops iris - they looked pretty good. Thanks for the ride! The scenes from Ann Arbor remind me a lot of Champaign-Urbana. 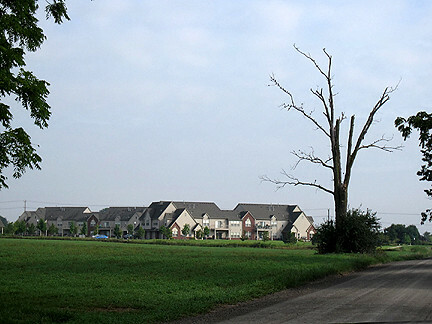 Subdivisions and business development just keep encroaching on farmland, and it's not unusual to see a barn or even a homestead surrounded by rows of identical suburban houses. It makes me sad, actually. Wow, Du wohnst an einem tollen Ort! Die roten Farmhäuser gefallen mir ganz besonders gut und alles sieht so gepflegt aus. Toll. Hey, Du bist ganz schön sportlich unterwegs mit Deinem Rad. Dachte eigentlich dafür seien eher die Europäer bekannt... liegt wohl an den Genen von Buxtehude *smile*. Die Hunde sehen übrigens Klasse aus... mit so einem richtigen zufriedenem Grinsen im Gesicht. This made me smile....and realize that in addition to being woefully neglectful of my blog, I also have not been riding enough. Need to fix both! 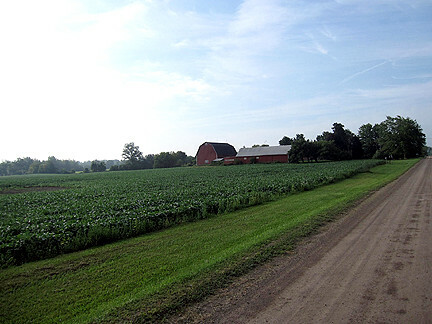 I love that farm and what a fun bike ride. Glad you took us on the tour. 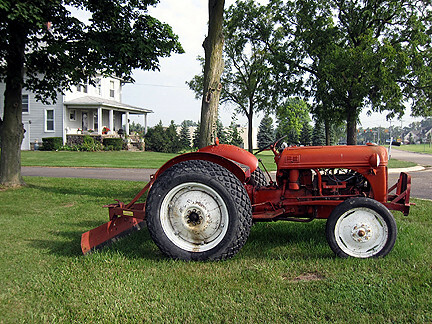 Very cool tractor, looks like an antique. 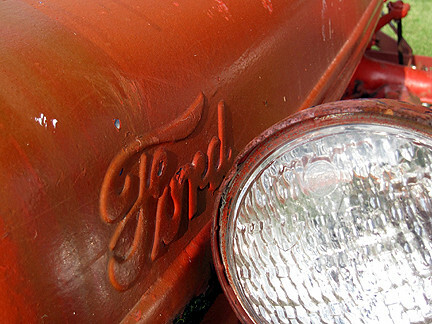 Hope they are not in a downturn, selling of the old machinery. Can't lose these working farms. That was a lovely cycle! I enjoyed that! This was a fun post, too. You see some beautiful and fun places on your bike. Some great pics. Ever since we saw that compass plant during the Dearborn Garden Walk I've noticed it everywhere. I can't escape it for the life of me, not even online. Lisa, Brandy and Butch meet my dog criteria: they don't smell my crotch, they don't lick me, and they don't jump on me (much, lol). It was really hot that day, near 90. You create your own breeze when riding, it wasn't until I was done that I realized I was insane to ride that day! 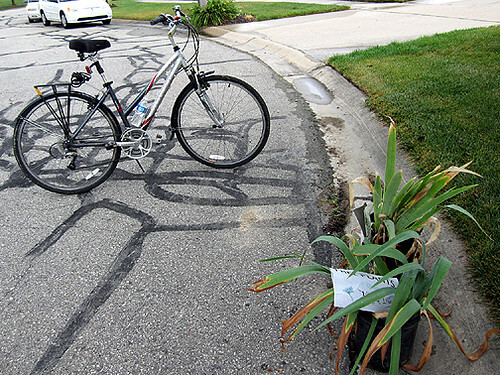 Meems, I didnt happen to have my panniers that day but I have enough irises. I really do. Cheryl, I've always liked bike riding; aside from walking it's the only "sport" that doesn't feel like punishment to me, lol. 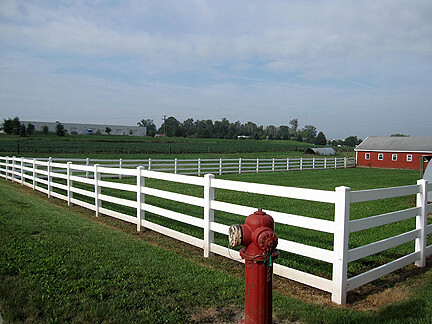 webb, The photos I chose to take make my area look more rural than it is, but yeah, Ann Arbor isn't a huge metropolis. I too love living near dirt roads; there are some north and west of town, too. Even east heading to Detroit. I like to take the scenic route. Tina, that's OK, I have a very eclectic musical taste. Alex, meine Schwaegerin hat die Hunde gut trainiert, und die wissen auch wenn sie es gut haben. Ich bin immer ueberrascht wie wenig Leute ihre Hunde regelmaessig spazieren. Kim, riding is easier than blogging, lol. I do fall out of the habit but have been pretty good about it lately. Gardenwalkies, Now that I think about it, they do seem to have something different out for sale every time I pass. I'm choosing to believe they are cleaning out their pole barn, not trying to make it financially. 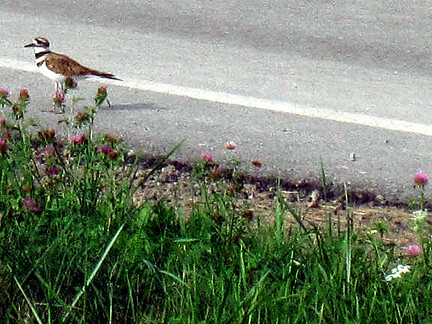 Vetsy, I love frog calls and this is the first year I've seen killdeer! Dee, the summer keeps slipping away. The reed grass is kinda cool in and of itself, if only it didn't out-compete native species. Salix, it turns out stopping to take photos during a bike ride makes the ride take a lot longer, lol. Sue, I purposefully head out to more rural areas to bike--riding on city streets (or even sidewalks) requires a LOT of caution and constant awareness. Despite Ann Arbor's smugness about being a bikeable city, I find it stressful; cars don't pay attention and potholes eat your bike. MBT, You mean ever since I ran up to it and practically hugged it, lol? I do love it (or maybe that's redundant). It was actually in my earlier post, but I know what you mean.